If you’re the parent or caregiver of a child with sensory processing disorder and sleep challenges, you’re no stranger to difficult bedtime routines and middle-of-the-night wake-ups that leave the entire family feeling sleep deprived and irritable. Poor sleep negatively impacts our bodies and our lives in so many ways, and for children who already struggle with self-regulation as a result of sensory processing disorder, autism, ADHD, and/or other developmental delays and challenges, restorative sleep is more important than ever. Sensory processing disorder (SPD) is a neurophysiological condition that makes it difficult for the brain to interpret and process information that comes from the body’s senses correctly. It can cause some kids to become over-sensitive to certain sensory stimuli, while in others it can make them under-sensitive. Like autism, sensory processing disorder lives on a spectrum, with each child experiencing and exhibiting different symptoms than others. SPD can affect only one sense, or many of the senses, and can lead to life-long social, emotional, and academic difficulties. It’s important to note that while many children with autism have a comorbid sensory processing disorder diagnosis, the two are very distinct disorders, and most kids with SPD do not fall on the autism spectrum. While most children struggle with sleep at some point in their lives, children with sensory processing disorder, autism, and/or ADHD tend to have greater difficulties falling and staying asleep, which can impact the entire family. The relationship between sensory processing disorder and sleep isn’t as well researched and documented as one would hope, particularly since SPD isn’t included in the Diagnostic and Statistical Manual (DSM). With that said, anyone who has experience with sensory processing disorder can appreciate why there is a connection between SPD and sleep. Kids who are hypersensitive to sound, for example, can find it impossible to ignore background noises like the ticking of an alarm clock, the sound of a neighbor’s dog barking, or the TV playing in the living room. Lights, smells, and scratchy pajamas are other examples of sensory sensitives that can lead to disturbances in sleep in sensory sensitive kids. Research also indicates that kids with sensory processing disorder have low levels of melatonin and high levels of cortisol, which act together to disrupt a child’s sleep patterns. Melatonin is the hormone responsible for regulating our sleep patterns, and should reach its peak during the evening hours to help us feel drowsy and fall (and stay) asleep. Cortisol is the body’s stress hormone, and when our systems are working correctly, our cortisol levels are highest in the morning and then fall off over the course of the day, helping us calm down in preparation for a good night of sleep. As you can imagine, a disruption in the secretion of one or both of these hormones can play a huge role in sensory processing disorder and sleep. Prioritize sleep. Contrary to popular belief, an overtired child does not go to sleep faster, or sleep for longer stretches of time. In fact, quite the opposite tends to be true, and since self-regulation tends to worsen when kids with sensory processing disorder are sleep deprived, it’s important to make sleep a priority in kids with sensory sensitivities. If you are already noticing signs of sleep deprivation in your child, try moving her bedtime an hour earlier for 3 nights to see if there are any improvements in how easily she falls (and stays) asleep. Be consistent. Another great tip for those struggling with sensory processing disorder and sleep is to be consistent. Make sure your child goes to bed and wakes up at the same time each day, including weekends and holidays, to establish a healthy sleep-wake cycle. Of course, this won’t always be possible when illnesses occur and when traveling, but if you opt for an earlier bedtime for 3 nights or so following any kind of disruption to ensure your child doesn’t get too overtired, it’ll be easier to get back on track. Remove electronics an hour (or so) before bed. As much as our children love their iPads and tablets, the artificial blue lights that are emitted by these devices can interfere with the release of melatonin, thus impairing the body’s circadian rhythm. So, as painful as it may seem, limiting electronic usage after dinner can be extremely beneficial if your sensory sensitive child struggles with sleep. Schedule physical activity an hour before bedtime. Instead of allowing your child to zone out in front of her tablet before bedtime, consider engaging her in physical activity to help her get rid of excess energy and to provide her body with the sensory input it needs to settle down before bed. Not sure what sensory activities would be beneficial? We’ve got over 55 ideas broken down by the different types of sensory sensitivites HERE. Make dietary changes. While the relationship between sensory processing disorder and sleep and food is up for debate, it isn’t a secret that consuming foods high in sugar and caffeine too close to bedtime can hinder our ability to settle down and sleep. My recommendation is to avoid them completely, but if that’s not possible, limiting them after the noon hour will definitely be helpful. Engage in quiet activities. Before getting your child ready for bed, find ways to engage her in calming activities. Dim the lights, read books, sing songs, talk about the day, and give each other cuddles to help signal to your child’s body that it’s time to wind down and get ready for sleep. Establish and stick to a bedtime routine. Another simple yet effective way to help a child with sensory processing disorder and sleep challenges is to develop – and stick to – a predictable bedtime routine. By doing the same things in the same order night after night, you are once again giving your child’s body signals that it’s time to slow down and prepare for sleep. Avoid overly stimulating activities at this time (surprisingly enough, baths with lots of toys can actually get kids excited rather than calm them down! ), and try to keep the process as short as possible (go to the bathroom, put PJs on, brush teeth, snuggles, lights out…) so it doesn’t become too cumbersome. Remove sensory distractions. If your child has sensory sensitivities to stimuli such as lights, sounds, and textures, take steps to remove them from her sleep environment. 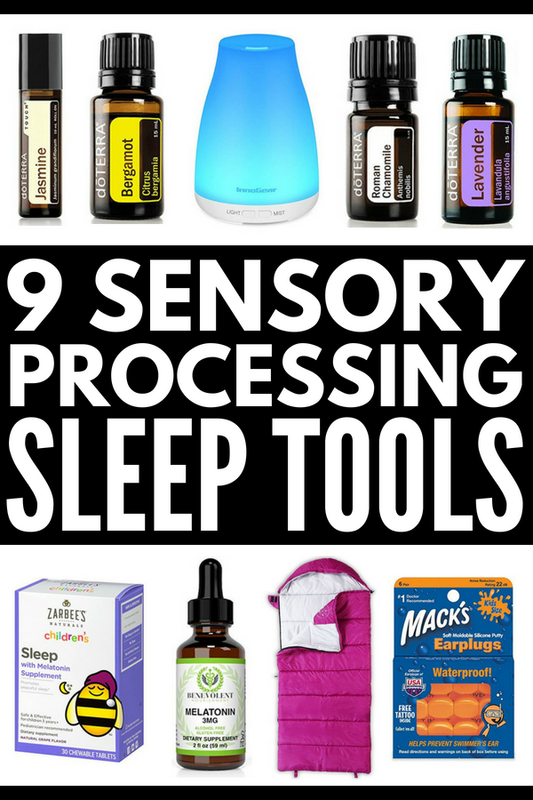 Check out 9 of our favorite products to help a child with sensory processing disorder and sleep challenges below for inspiration! Keep a sleep diary. If you’re having difficulty pinpointing the reasons for your child’s sleep challenges and/or can’t figure out why your child struggles some nights and not others, keeping a nightly log in which you detail the events before, during, and after bedtime, as well as anything that occurs during the night, can help you look for patterns over time. I suggest doing this for a full week, and then setting aside uninterrupted time away from distractions so you can objectively review your notes and look for consistencies. Don’t be afraid to ask for help. Sleep plays such an important role not only in our children’s development and well-being, but in our ability to be good parents, so don’t be afraid to talk to a sleep coach (I highly recommend The Baby Sleep Site as they offer gentle, cost-effective, personalized plans with email support), enlist the help of your doctor, or book an appointment with a naturopath. It will be one of the best gifts you give to you and your family. Weighted blankets. As I mentioned earlier, kids with sensory processing disorder sometimes have lower levels of melatonin, which is the hormone that regulates our sleep patterns and makes us feel drowsy, and weighted blankets can help combat this deficit. The deep pressure and sensory input offered by weighted blankets triggers the release of serotonin, which in turn leads to the production of melatonin and helps us sleep. Weighted blankets have been shown to have positive impacts on sensory processing disorder and sleep, and are also popular for individuals with autism and anxiety. Before ordering your weighted blanket, remember that they should be no more than 10% of your child’s body weight plus 1 or 2 pounds, and that blankets of any kind shouldn’t be used until a child is over 12 months of age. Melatonin supplements. I struggled with whether I should include melatonin supplements in this list of products to help a child with sensory processing disorder and sleep as the safety of melatonin usage in young children isn’t clear. I did want to mention it as an option though, as I have heard so many parents rave about the effectiveness of melatonin supplements in helping their sleep disordered children fall asleep faster, and stay asleep longer, but I urge you to discuss the risks with your child’s doctor or naturopath before giving these supplements a try. Essential oils. Essential oils for autism and sensory processing disorder can have so many positive effects on children and their families. The calming effects of lavender oil can help kids sleep better, bergamot oil is a powerful relaxant and can reduce nervous tension, anxiety, and stress, roman chamomile oil can reduce mental anxiety, paranoia, and hostility, and is also a great stress-buster that has been found to help with insomnia and muscle tension, and jasmine oil works to regulate feelings of stress, anxiety, and over-excitement in the brain. And that’s just breaking the surface! There are HEAPS of different oils and blends to help with sensory processing disorder and sleep, and we’ve written an entire post to help you get started HERE. White noise machine. If your child is sensitive to sounds, a white noise machine can help drown out background noises within your home so she can get a better night of sleep. Ear plugs. If your child can’t tolerate a white noise machine, ear plugs are another option to consider. They aren’t as effective as noise cancelling headphones, but are great for blocking out distant noises that may make it difficult for your little one to fall (and stay) asleep. Blackout blinds. Blackout blinds can make a world of difference for kids who are overly sensitive to visual stimuli and find it difficult to sleep with even the smallest hint of light in their room. They offer a great tool to help your child sleep later in the mornings and/or if they are struggling to fall asleep when it’s still light outside on long summer days. Eye mask. If your child still finds her room too bright to sleep despite installing blackout blinds and removing night lights and digital clocks, an eye mask is another option to consider if your child can tolerate one. Bed tent. Another great product to help children with sensory processing disorder and sleep is a bed tent. Designed to fit over top of your child’s bed, these tents offer another way to block out light and noise while simultaneously providing your child with an added layer of comfort and safety. Sleeping bag. My last recommended product to help kids with sensory processing disorder and sleep challenges is a sleeping bag. You can purchase sleeping bags specifically designed to provide deep pressure input to kids with sensory sensitivities, or you can use a basic sleeping bag and fill it with stuffed animals (or something of that nature). I hope this collection of tips and products to help kids with sensory processing disorder and sleep challenges proves useful to you and your family in your quest to find your way back to a peaceful night of restorative sleep! If you found this collection of tips and products to help kids with sensory processing disorder and sleep challenges helpful, please share this post on Pinterest! And if you’re looking for more tips and tricks related to autism and sensory processing disorder, please follow our Autism and SPD board where we share all kinds of great ideas we find each day!